It feels almost tautologous to write about the best specialty coffee in Sydney, given that we’re a city of zealots who only ever settle for the very best anyhow. That said, some beans do carry specialty status by virtue of their origin and the way they’re roasted and brewed. We’ve sipped our way through this city’s artisan cafes to bring you the very best coffee in Sydney. Run by two of Sydney’s most famous cafe masters, Artificer is pretty much coffee royalty. In fact, with a caffeine-only menu (that’s right, not a toastie in sight!) and a super minimalist space, coffee isn’t just serious business here—it’s the only business. Dan Yee (formerly Salvage) and Shoji Sasa (Mecca and Single Origin) are experts in finding and roasting delicious coffee. They also pay particular attention to the fine balance between roasting and brewing that maximises the flavour of each bean. It’s here that coffee appreciation reaches its extremity and we love every wonderful sip. It’s a roast works and coffee bar fondly known as the “mothership” to coffee aficionados and Single Origin-acolytes everywhere. There’s a La Marzocca Linear PB churning out different flavours each month and a range of specialty filter methods on offer, including cold drip, cold brew, and pour-over. Plus, the whole joint is run on solar energy so there’s some extra good environmental vibes in every drop. With a stellar reputation and sphere of influence that basically stretches right across greater Sydney, Campos is perhaps the original specialty coffee brand. What makes each cup of Campos so good? Owner Will Young believes it’s a tidy combination of bean, barista and machine. In addition to great roasting and brewing, selected Campos cafes now feature cupping rooms (sounds dirty, but it’s not) where customers can enjoy tasting sessions with background information on how coffee is sourced and processed. It’s another tiny, coffee-focussed cafe in Surry Hills complete with coffee trees at the entrance and bags of beans lining every wall, but owner Reuben Mardan (ex-Mecca) knows how to make his single origins stand out from the crowd. Two machines, including a lever-operated Mirage, churn out house blends and at least one other coffee sourced from another specialty roaster. At Reuben Hills, beans are roasted onsite and sourced from Central America (look up, you’ll see all the machines!). The Surry Hills space also includes a coffee lab/cupping room where customers can learn all of the fine nuances that differentiate each bean. Despite the fact that Coffee Alchemy supplies all over Sydney, you can’t beat the coffee that comes direct from the dealer. If you can’t make it to Marrickville for some sweet, sweet Alchemy goodness then Gumption, located smack bang in the centre of the CBD, is the next best thing. With four coffee outlets in Sydney and a thriving wholesale business, Mecca is a solid brand that sources quality beans from Kenya, roasts them daily, and presents it all in an accessible and unpretentious manner. They were one of the first brands to do siphon coffee in Australia and still boast a rare Clover 1 espresso machine in their King Street cafe. Despite a solid start with single origin beans roasted by owner and barista Corie Sutherland, things at Edition get a little experimental from here. Beans are used in batch brew, pour-over, aero-press, Japanese drip, and cold brew methods, and there are even reports of sound waves being incorporated into the brewing process. As the name suggests, this café in Bondi offers more of a coffee immersion than a cafe experience. Beans are roasted daily and turned into ristretto, espresso, filter coffee, and a range of teas that all pack a flavour punch. From its humble origins as a hole in the wall cafe and roaster in Balmain, this little puppet has established itself as a leading specialty brand. 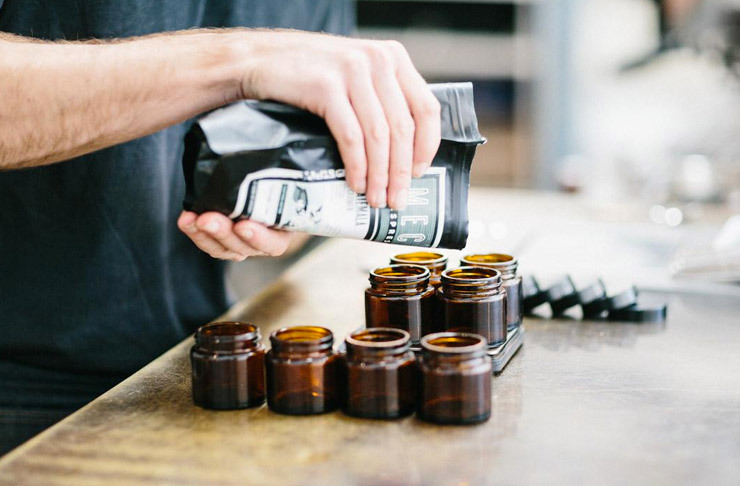 Buy boutique beans online, sign up for barista training or simply head in to their Annandale or St. Peters cafes for some specialty coffee in all forms. Who says The Shire doesn’t have good coffee? White Horse Espresso in Sutherland are sourcing, roasting, and extracting the best coffee beans around… And you can taste the difference. You know it’s one of the best coffees in Sydney when you can see queues out the door any given morning (except on Sundays, when they’re closed).